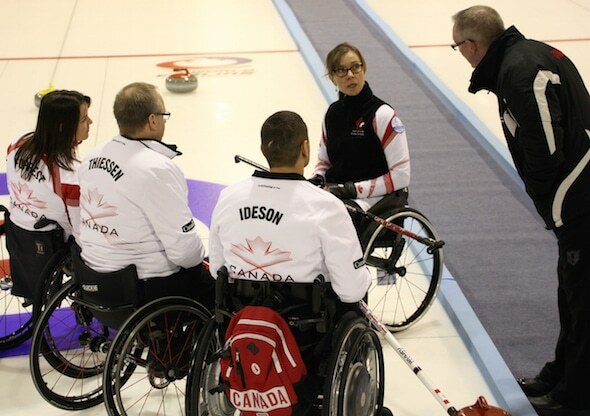 Team Canada picked up some momentum with a win to close out Sunday after dropping its first game of the day at the 2015 World Wheelchair Curling Championship in Lohja, Finland. 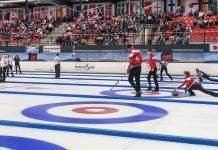 Canada started Day 2 of competition with a 6-4 loss to Jens Jaeger of Germany during the morning draw at the Kisakallio Sports Institute. The loss marks the first time the Canadian team has opened the 10-team round robin with two losses at the World Wheelchair Curling Championship. Skip Mark Ideson of London, Ont. (throwing lead rocks), vice-skip Ina Forrest (Armstrong, B.C. ), third Dennis Thiessen (Sanford, Man. ), second Sonja Gaudet (Vernon, B.C. ), alternate Marie Wright (Moose Jaw, Sask. ), and coach Joe Rea (Prince George, B.C.) blanked the first end, but gave up a steal of two in the second. Canada replied with a deuce in the third end and stole a point in the fourth, taking a 3-2 lead. Germany regained the lead in the fifth with two points, and stole singles in the sixth and seventh ends. Canada mustered a single in the eighth, but needed at least three points to force an extra end. Canada found its way to the win column with an 8-3 victory against host nation Finland, skipped by Markku Karjalainen. The Canadians opened with two steals of two in the first and second ends. Finland attempted battling back by scoring two in the third. But, Canada scored a single in the fourth, two in the fifth, and one more in the seventh before Finland conceded. Had Canada lost its third game in a row, it would have joined Norway and Slovakia in the basement of the standings. The win elevates Canada to 1-2 and puts the team on pace with Finland along with the nation it will play Monday morning, Sweden. 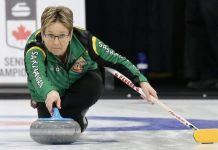 Canada will take on Sweden, skipped by 2013 World Wheelchair Curling Championship silver-medallist Jalle Jungnell, at 9:30 a.m. Lohja time (2:30 a.m. EST). Following that, it will be a North American matchup when Canada plays Patrick McDonald and his team from the U.S. at 3:30 p.m. Lohja time (8:30 a.m. EST). Live scoring and standings from the 2015 World Wheelchair Curling Championship can be found at: http://wwhcc2015.curlingevents.com/.